Editor’s Note: The Drunken’ Donuts have been removed from the menu. All right, all; it’s time for some serious DONUTAGE!! Just last week I once more headed over Bay Lake and through the woods to Disney’s Wilderness Lodge. 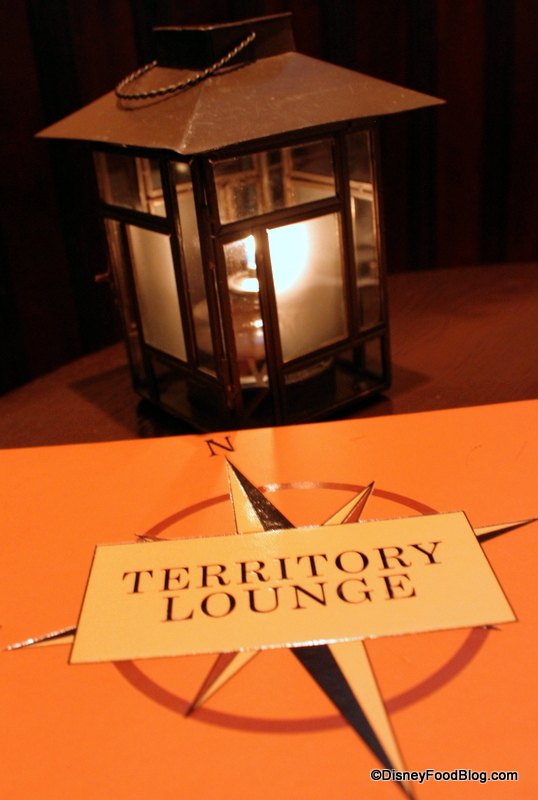 The Territory Lounge beckoned with a sweet menu item that I couldn’t resist trying. This laid-back spot is one of my favorite places in all of the World to relax while enjoying some truly spectacular pub grub. Rarely crowded and always staffed with the most excellent cast members (Yay, LouAnn! 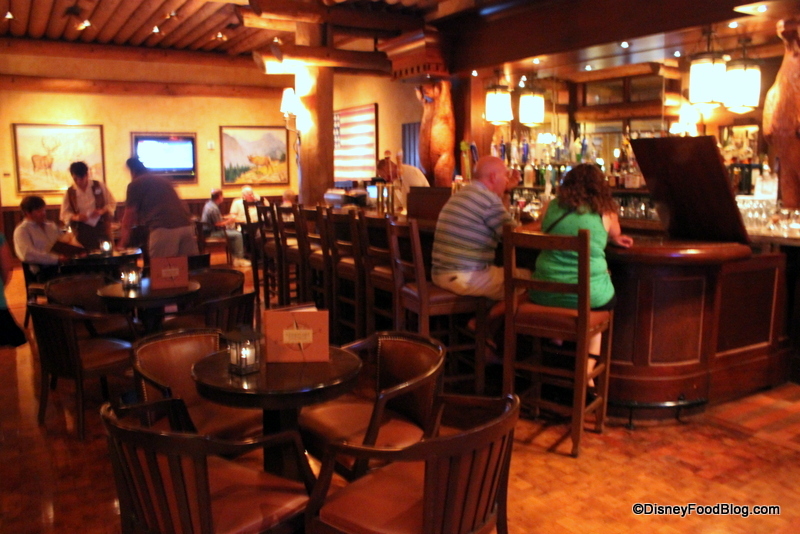 ), I still think that Territory Lounge is one of the best kept secrets at Disney World. But when Kathie F. tipped me off recently that she and her husband had enjoyed a new-to-me dessert offering here, that guaranteed I would be visiting the bar sooner rather than later. Onion Soup has joined the team as well, and the Wild Mushroom Flatbread has returned by popular demand. 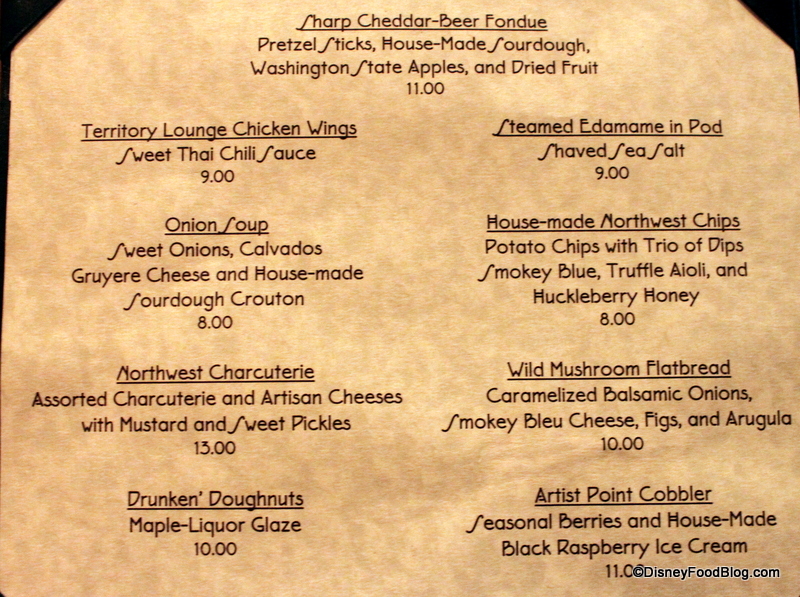 And because they’re awesome — the Northwest Charcuterie and Sharp Cheddar Beer Fondue are still alive and kicking! But the most interesting change on the menu is the addition of two desserts. One is a favorite of ours from the Artist Point kitchens: the Artist Point Berry Cobbler. And the other one was what I was after on this evening: DONUTS. 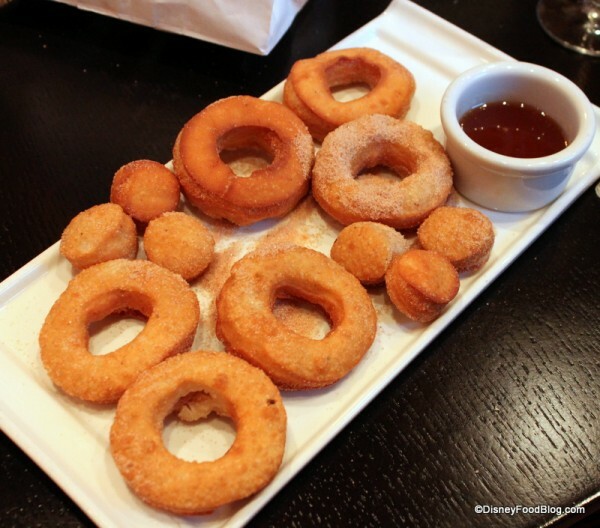 And not just any donuts… Drunken Donuts! (Disclaimer: I have no idea why there’s an apostrophe after Drunken in the menu. I’m leaving it off in my review due to my uber-grammatical tendencies, but if one of you can tell me why it belongs there, I’ll happily add it.) 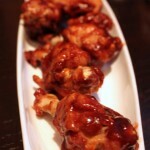 What makes them “drunken?” A dee-licious dipping sauce, or “glaze,” that’s served on the side. More about that in a minute. The donuts come delivered beignet-like in a paper bag — and the tell-tale signs of oil seeping through hints at the freshness. I love how they dressed up the plain white bag with a Territory Lounge stamp! Your job? 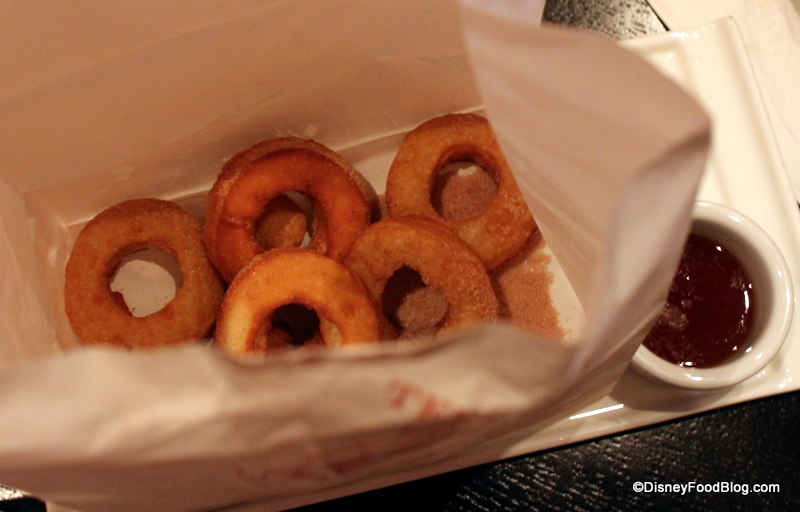 Shake up the bag to make sure your donuts are evenly coated with cinnamon and sugar! Peering into the bag — after the sweet, deep-fried smell and heat hits you in the face — you see the golden donuts and a generous amount of cinnamon and sugar. A closer look shows you the tiny imperfections that are the hallmark of handmade goods. These, my friends, did not come from the local donut plant. And these are every bit as delicious as you would expect — nay, require — expensive donuts to be. Ever-so-slightly crunchy on the outside from the frying and sugar, and yeasty but soft on the not-too-sweet inside. Yep. That’s it! A three-ingredient wonder. Sigh…I can almost taste it now. So, the verdict: are these donuts worthy of the steep price tag? Well, they are pretty fantastic. And served in the whimsical way that they come to your table, with all of the charm of the Territory Lounge, I say yes. For $10, you get six donuts and six donut holes – plenty to satisfy the sweet tooth (if not the appetite) of 2 or more people. As an alternative to a table service dessert (usually costing no less than $7 a pop) or a park treat, I’d say this is a good one. And a relaxing one, at that. 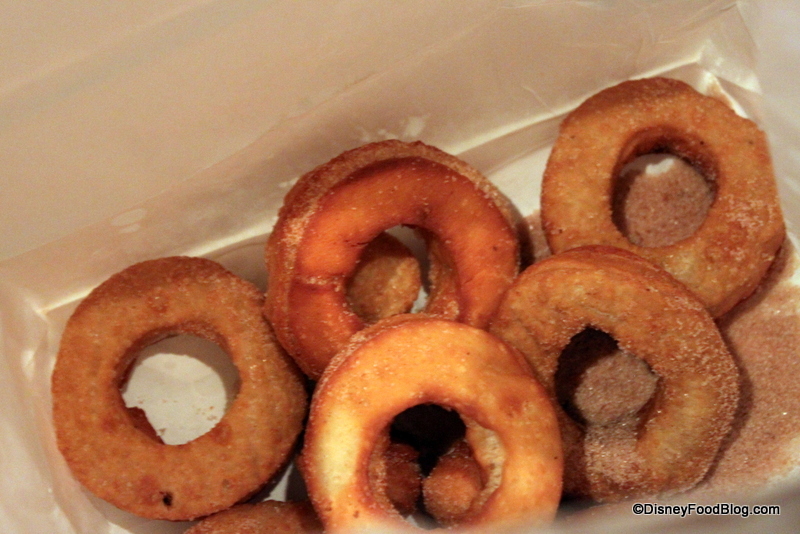 Would Drunken Donuts be on your Disney dessert wish list?? Let us know below! Oh my goodness, those sound delicious! We’ve never visited Wilderness Lodge but always keep meaning to so this might seal the deal, especially since my daughter turns 21 this spring! I have to confess too that I got all excited and ‘wow they’ve really got into the spirit here’ because I thought it said ‘mouse made’ on the menu … I realised soon after that it’s ‘house made’ ah well, although I can totally see Mickey at al jazzing up the kitchen! I can smell them, I can taste them…. How quickly can I get to the airport??????? Butter, Grand Marnier, and maple syrup! I’d ask for a separate glass of that to drink straight down! Donuts and the holes! What a concept. This should be de rigueur for all donut shops in the USA. I love the Territory Lounge and these donuts only add to it. Thanks for sharing! Yum! 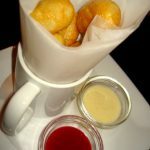 Next trip now includes fondue AND donuts at Territory Lounge! Can’t wait! Drunken’ Doughnuts – according to an English teacher – she posits the apostrophe is used because doughnuts are plural – if it was drunken doughnut it wouldn’t need an apostrophe – in any case it’s not your grammatical error, if it is a grammatical error. 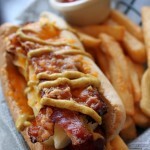 You are simply quoting the Disney menu – and a quote should be just that a direct quote – otherwise it’s paraphrased! If these are not still offered the first week of July, there may be an ugly situation at the Wilderness Lodge. There’s no such thing as a bad doughnut. We will be staying there in June — Will they allow kids inside, since it’s a pub? There are some things on the menu that sound deeeeelicious! Sounds delicious! As a New Englander, I can see that their name is an obvious reference to the Dunkin’ Donut chain, which is odd because I’ve been told by friends who have lived in the Pacific Northwest that the chain does not have a big presence on the west coast. As a high school English teacher I can say with a fair amount of certainty that the apostrophe serves no grammatical purpose. 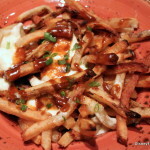 We’re heading to Disney in early June, and I can’t wait to try these pub items! I love the TerriTONY lounge, its one of my favorite place for a drink and snack !!! Oh yum! 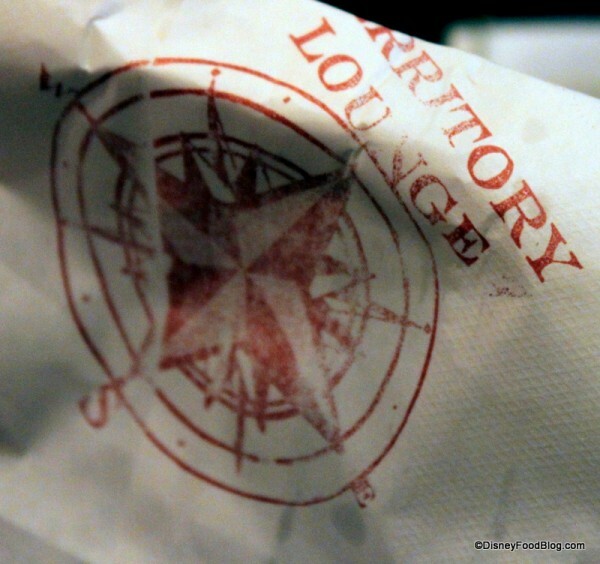 I have been wanting to try Territory Lounge for awhile now, but this seals the deal. Beer fondue and Drunken’ Donuts! And as a New Englander, I suspected immediately that the added apostrophe was a nod to Dunkin’ Donuts. Ahhhhh, I can almost smell them. The first thing that I noticed when I looked in the bag was the donut holes! They look really yummy; I want to visit WL someday, but I know that after I do, I’ll want to stay there! That’s a nice little menu. Good for a light lunch or dinner I’d you have a big meal at an earlier time. I was, however, disappointed when I realized it was Drunken’ not Dunken’. Oh, yes…these will be in my face in October!! We are there in November – oh yeah!! Did you get to try the cobbler? Or see the cobbler? Would love it if they had brought back the old cake style. Oh heavens these look amazing. Good job we’re flying out on Saturday and spending 2 of the 3 weeks at WL! How similar are these to the decadent donuts available only at the water parks? Rick — Very similar. 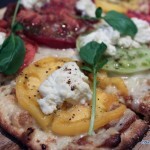 Freshly made, soft, and delicious. The added dipping sauce is divine, though! Has anyone been to the TL recently? Say in Aug-Sep? I want to know if they are still serving the charcuterie plate, drunken doughnuts, and beer cheese fondue because the official menu on Disney website is never really updated, and the other menus I scrounged up online were dated July, but both offered different menu items! 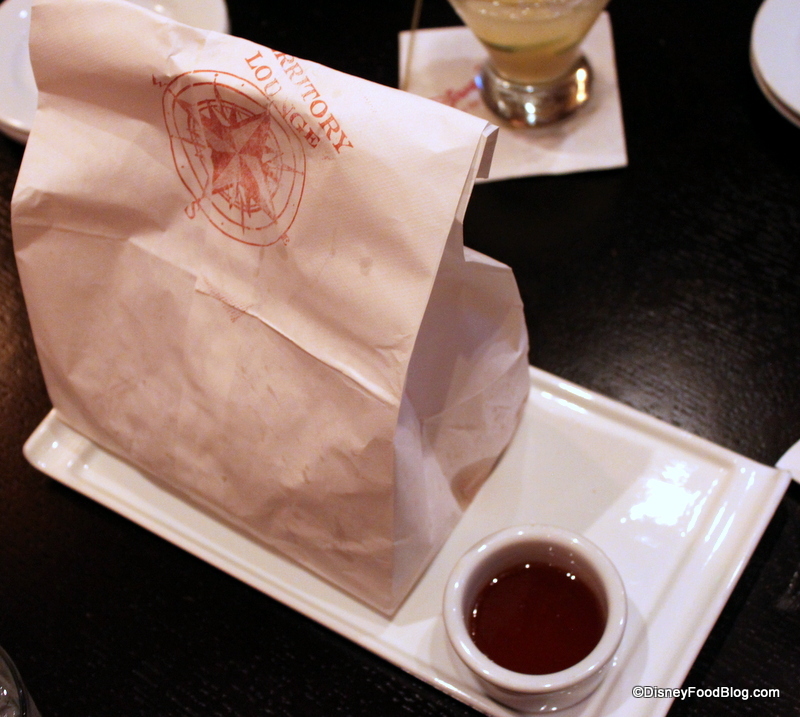 I went to TL on Nov. 3, 2013 with hopes of trying the Drunken’ Donuts and they are no longer on the menu. Our waitress said that they no longer have the ingredients so they can’t make them at all. Anyone know if these were discontinued? They’re not on the online menu.